We're half way through July and keeping busy enjoying summer and all the fun activities, from camp to tennis to swimming and hours of soccer at the park. Of course, my kids are staying busy indoors, too, on rainy summer days, and passing their time with their favourite toys—like Nerf guns, their BB-8 Droid, and video games—all of which require batteries. I've said it before—and I'll say it again—it's essential to have batteries of all sizes in the house, all the time. Duracell is the name we trust, and the Duracell Quantum Hi-Density Core battery stores more power boosters to provide longer lasting performance than ever before. It's the battery we use for everything that needs to be powered up—from the remote control to toys and more. Duracell definitely helps give more hours of play out of my children's toys during, before, and long after the holidays have passed, and although we're not thinking ahead to winter holidays just yet, I love seeing the toys that'll get my kids excited, but before we get excited for that, I bring out toys that my kids have forgotten about over the months—the toys they needed to have just a few months ago. I've always loved rotating toys in my house. Playtime with toys and games are an essential part of a child's development, and I love that Duracell helps power imaginations in children. 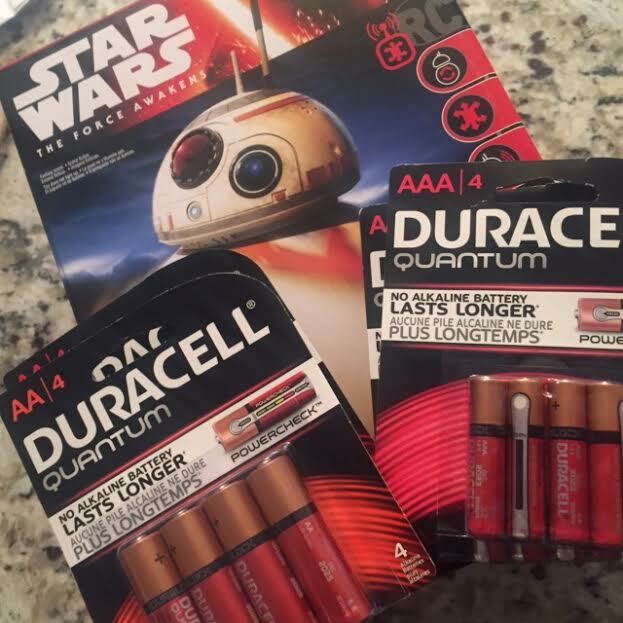 I've partnered with Duracell and am giving away a Star Wars The Force Awakens BB-8 Droid for your kids to enjoy—and of course, lots of Duracell batteries to keep it powered up for hours of play. To enter to win, just leave me a comment below telling me how you help your children power their imaginations through play. I'll pick a winner on July 30th, randomly. Disclosure: I have been compensated for this post and all views and opinions are my own. We are always using our imagination when playing, we pretend that we are pirates, robots, or princesses! I think its so important to teach kids to use their imagination when playing. I love encouraging imagination play with my grandchildren. We fly, we run, we are princes and princesses, the list is endless lol Thanks for a great giveaway! I've always loved doing crafts (and reading as a child) so I always made sure there was craft supplies available in our house for both kids and this year I have started buying a little bit of stuff from the dollar store for my a Christmas present for my niece. I am a volunteer mentor to an amazing little boy with so many interests. I follow his lead and thus far it has taken me on all sorts of adventures, from animals native to Australia, to drones and robotics. I love playing interactive and fun games with my grandson. Enforcing positive activity while having a lot of fun. I encourage my kids to use their imaginations by providing them with play options that are open ended. It's amazing what kids will come up with when they have some decision making power. I help the kids in my life power their imagination by encouraging play with different toys that will engage all senses. I power my grandchildrens Imagination with Duracell playing electronic games like monopoly and battleship. I don't punish or limit his imagination. I like to provide my kids with lots of crafty supplies so they can build and create. I also love to set up summer scavenger hunts! Every few months we go through their toys to see what to keep or what to toss or donate. This usually has them interested in the long lost toys of the bottom of the toy bins. Most of them will need a battery change and then they are back to playing with them again. I buy toys that foster imagination and creativity in my grandchild, and always have plenty of art and craft supplies on hand. (As well as a good stash of batteries, for her Leap Frog). I love rotating toys but haven't found a good system yet. Anyway! As much as I love toys that don't plug in or need batteries, they seem to be especially drawn to those! Batteries are definitely a must. Thank you for such a great giveaway. When my grandkids come over I always have a variety of games, toys and puzzles for them to play with. If they are playing Star Wars dress up with their Light Sabres I always keep Duracell Batteries on hand in case we need to recharge those light sabres. Electronic Battleship is played quite often and if the game powers down before the end it could be a nightmare. I encourage the grandkids to use their imagination while playing. This leads to lots of fun for every one. I always ask y kids input before purchasing toys for them so they will enjoy them and tons of Duracell batteries to keep them going. I help my daughter to power her imagination by allowing her to get messy and explore things for herself. Giving children an opportunity to let kids create their own games while playing outdoors is a good way to help them use their imagination! I understand the power of play and letting a child express him or herself! My 8 year old is such a creative little guy who loves to let his imagination run wild. He is a huge Star Wars fan and loves using cardboard boxes to create droids and ship models! BB8 would be an awesome addition to his epic battles and with all those Duracell batteries, he's guaranteed hours of fun! what a fantastic giveaway thanks! I love to help my boys power their imaginations by using creative play like building legos or using old containers to create new things like robots or aliens. Gotta love how open minded kids are! My kids have a shelf of dress up clothes. The clothes inspire their imaginations to wonderful heights. I let them use stuff from around the house to extend their imaginative play: sheets, buttons, pots, cardboard boxes, etc. We often start with a book and then imagine games from the book. I give them plain paper and a bunch of craft supplies. It's interesting to see what they come up with. I empowered my children's imaginations as they had a trunk filled with dress up clothing, a craft box filled with crayons, paper, tape, scissors etc. I supply craft supplies of all kinds in this huge box - there is no end to the possibilities they can come up with. This gives them a chance to touch, (sometimes smell), and see the different mediums as well as contributing to their color and creative understandings of the world. It also promotes problem solving, relaxed therapy, and for the really young ones we sometimes have over - the pincer grip! I help my daughter by playing along with her games, letting her use her imagination to make up the story or rules, even if they are not logical to me.